Be the first to share your favorite memory, photo or story of Velvia . This memorial page is dedicated for family, friends and future generations to celebrate the life of their loved one. 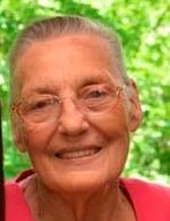 Velvia Prater, 85 of Prestonsburg, KY, passed away Friday, March 15, 2019 at her residence. Born June 13, 1933 in Ivyton, KY, she was the daughter of the late Albert & Cassie Cole Watkins. Velvia was preceded in death by her husband, Alex Prater. Velvia was a homemaker and a member of Chestnut Grove Old Regular Baptist Church. She is survvied by her children: James Prater, Amos Prater, Manis Prater, Ellavene Prater, Jolene Morgan & Janice Prater all of Prestonsburg & Christine Bingham of Lick Creek, KY; brothers & sisters: Forester Watkins of Jenoa, OH, Ronald Watkins of Hazel Green, KY, Edmond Watkins of Prestonsburg, KY, Opal Sparks of Wallbridge, OH, Agalean Helton & Donna Helton of Salyersville, KY & Debbie Kay Prater of West Liberty, KY; 9 grandchildren, 9 great grandchildren & 2 great-great grandchildren. Along with her parents & husband, Velvia was preceded in death by her brothers & sisters: Raleigh Watkins, Lonnie Watkins, Lee Edward Watkins, Tollie Watkins, Ollie Watkins, Flora Spaulding, Ora Watkins, Dora Watkins & Jewel Watkins. Velvia will be missed by all that knew and loved her. "Email Address" would like to share the life celebration of Velvia Prater. Click on the "link" to go to share a favorite memory or leave a condolence message for the family.